Derwent XL Graphite will allow for line work and subtle blending to expressive marks and deep tonal work, Derwent XL Graphite is smooth and refined. 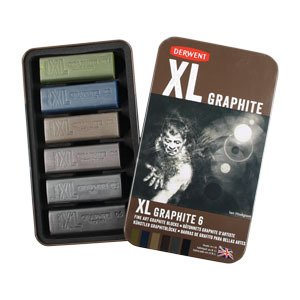 This soft, fine art Graphite is water-soluble so you can add water to create splashes and washes. On a damp surface, Derwent XL Graphite sticks release a creamy strip of live pigment which, when dry can be re-worked with layers of contrasting colours and marks. Try using embossing tools or lifting out tone and colour with an eraser. Graphite Pencil Tin of 6 contains: 1 of each (Block size 20 x 20 x 60mm) Olive Green, Dark Prussian, Raw Umber, Burnt Umber, Soft and Very Soft.